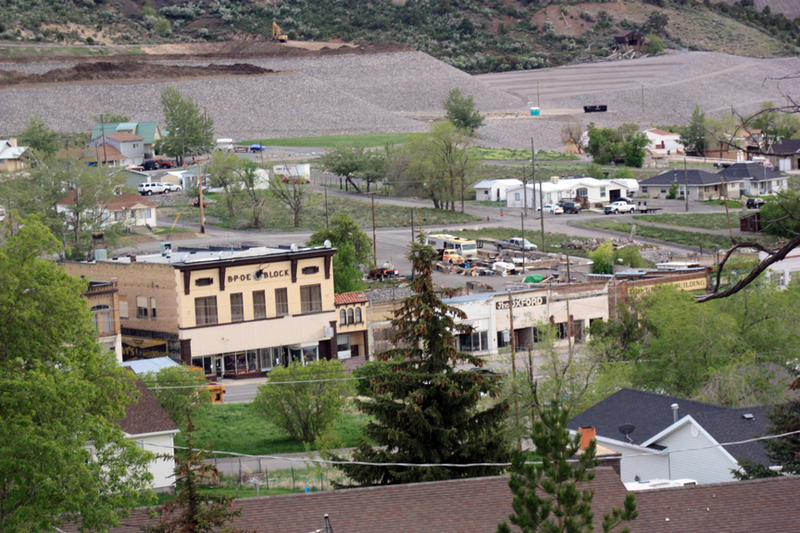 On my visit to the area around Eureka, Utah last Friday, June 4, I not only wanted to visit Mammoth and Silver City, but to also document the efforts by the Environmental Protection Agency to clean up the town. I had traveled through Eureka a few days before on Memorial Day and noticed that the lawn and soil around the LDS chapel in Eureka was being dug up to a depth of about 18 inches. 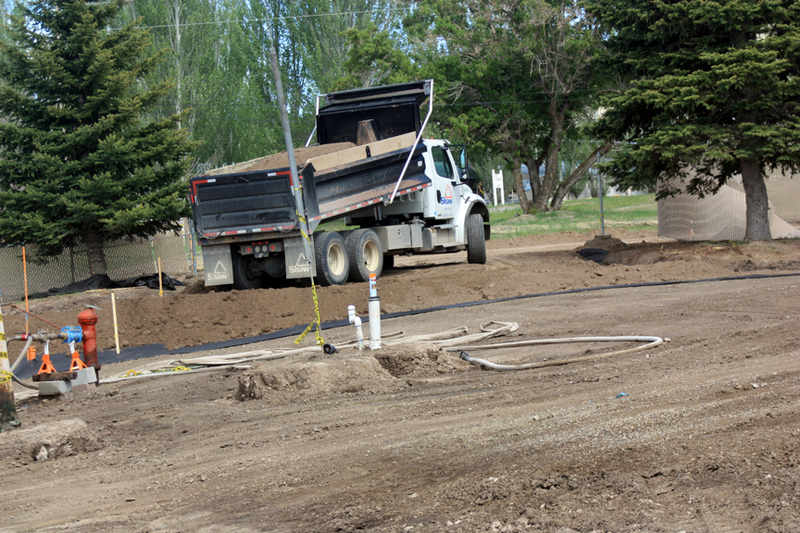 On Friday, crews were in the process of bringing in new soil in dump trucks and spreading it over a layer of black plastic where the lawns used to be. Normally I wouldn’t have noticed it much – just chalked it up to them putting in a new sprinkler system or something similar. But I knew differently. This was the latest site in an ongoing process to replace the topsoil throughout the entire town, which is a huge undertaking. 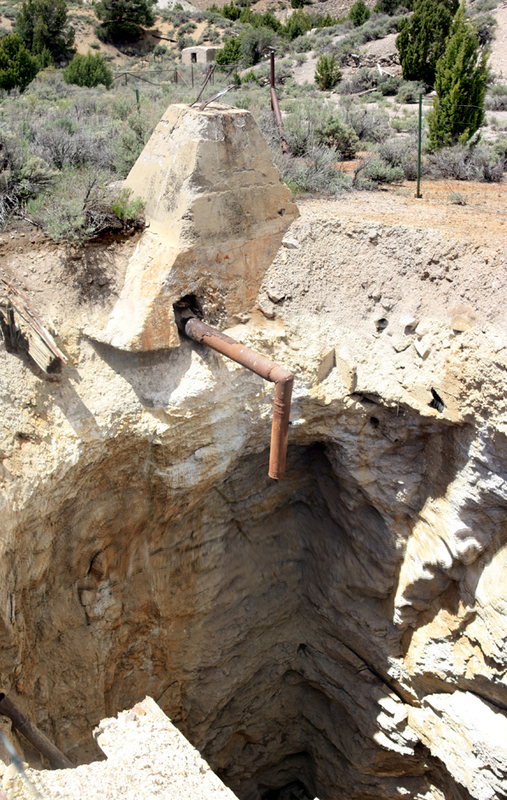 All the old mine sites throughout the district have left a legacy of environmental contamination and pose a danger to careless explorers who try to enter mine shafts or tunnels or ruins. 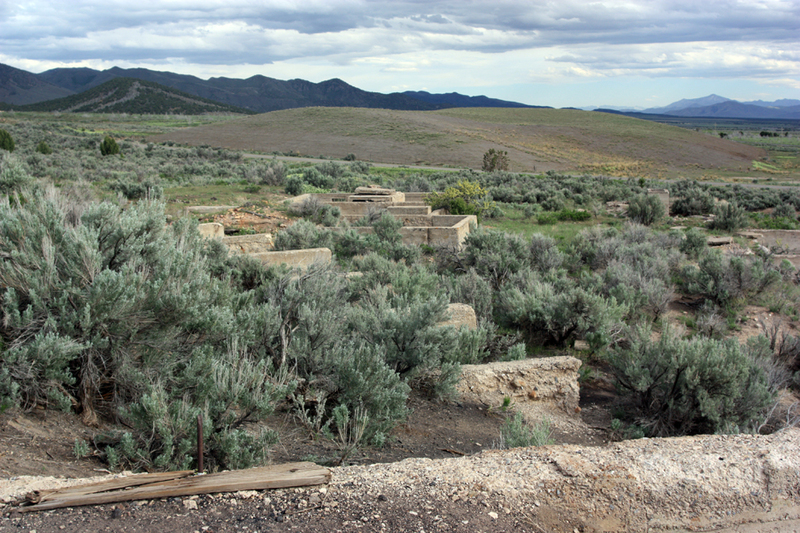 When silver ore was discovered in the East Tintic Mountains by George Rush in 1869, it ignited a stampede of mining claims that spread throughout these mountains. New deposits were soon located and claimed, and the ore was assayed to be rich in silver, gold, lead, zinc, copper, and other minerals, usually in the form of metal sulfides. The most level sites near the mines quickly grew into the towns of Eureka, Mammoth, Silver City, Diamond, Knightsville, Dividend, etc. These towns were usually as close to the mines as possible so the miners didn’t have far to walk, so that miner’s houses and the mine buildings, hoists, smelters, railroad depots, and city businesses all competed for space in the narrow canyons. Tailings dumps of discarded minerals and slag from the smelters covered the hillsides around and above the town. Dust from these piles was blown by the frequent winds (this is western Utah, after all) and blanketed the whole town. Nobody thought much of it at the time. It was all just part of life in a mining town. But the entire topsoil was contaminated with lead and other metals down to about two feet under the surface. Today, the EPA has identified the area around Eureka as a SuperFund site, spending millions of federal dollars to clean up the contamination. One by one, the yards of the residents and businesses are being dug up and the soil replaced, brought in from a staging area east of town. 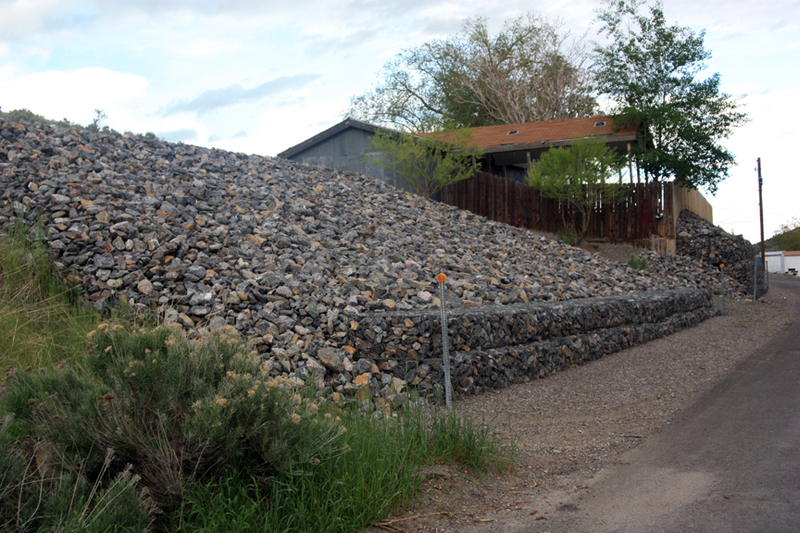 To prevent the tailings piles from blowing more toxic dust around the town, broken limestone rocks called rip-rap are being hauled in from a nearby quarry and are carefully placed to cover over the tailings piles to prevent further erosion by wind and water. Mine dump in East Tintic Mtns. The work is progressing throughout Eureka, but the entire mining district has the same problem. 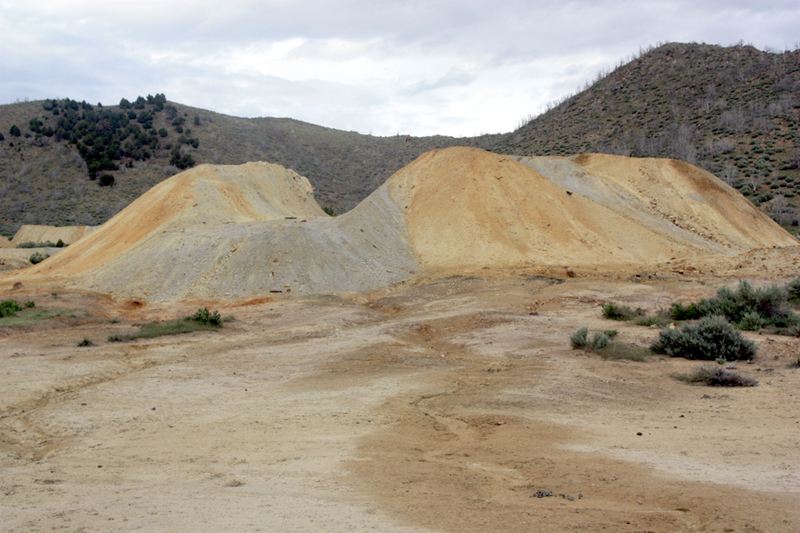 Recent exploratory work has dug up the tailings piles in Silver City again, leaving the yellowish sulfides once again exposed to erosion. Many of the mine sites in the hills are owned by small-time private owners who keep the mines open on an occasional basis. They don’t have the resources to prevent the erosion of their tailings piles, and much of the East Tintic Mountains is contaminated just as Eureka itself is. Another problem in the area is the many abandoned mine tunnels and shafts. 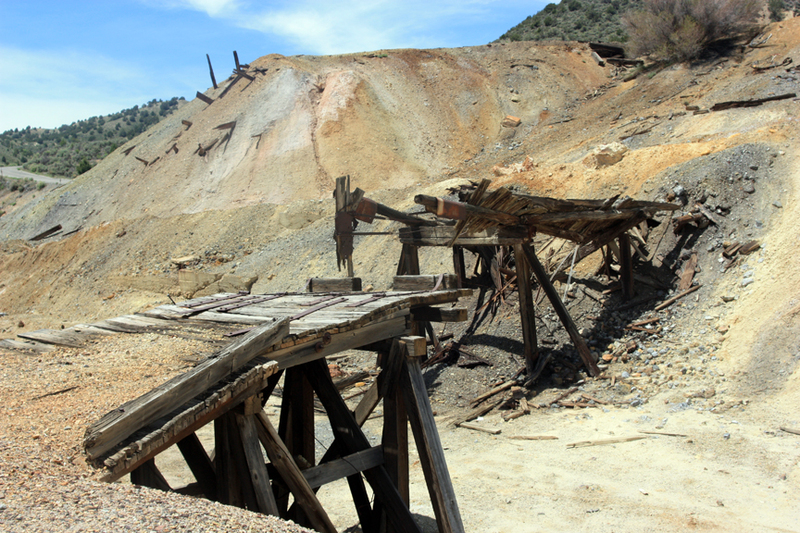 Mines today are required to provide reclamation funds before the mine can even open, but it wasn’t an issue in the 1800s and early 1900s when most of these mines were active. The owners took the ore from the hills, then left all the scars, holes, pits, slag, tailings, and buildings behind when the ore ran out and their companies closed. 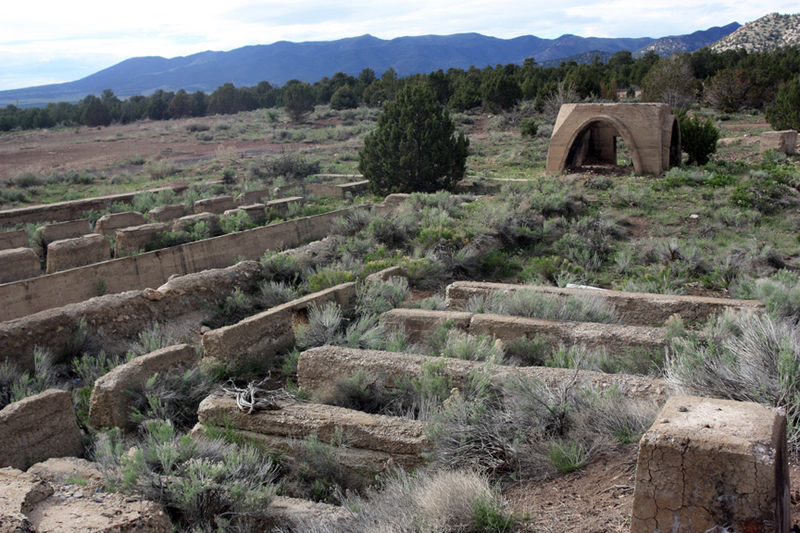 Now these ruins are a hazard to casual explorers; every year or two someone dies falling down an abandoned mine shaft in Utah. The state has begun a program to close off these mines; to place grates or metal doors in the tunnels and shafts or to blast the entrances closed. Over 8000 mine sites have been closed off throughout the state through this program, but many, many more remain to be done. Smelting or concentrating the ore brought its own environmental problems. Jesse Knight, the silver magnate that started Knightsville just southeast of Eureka, also built a smelter at Silver City in the early 1900s that operated for about eight years. 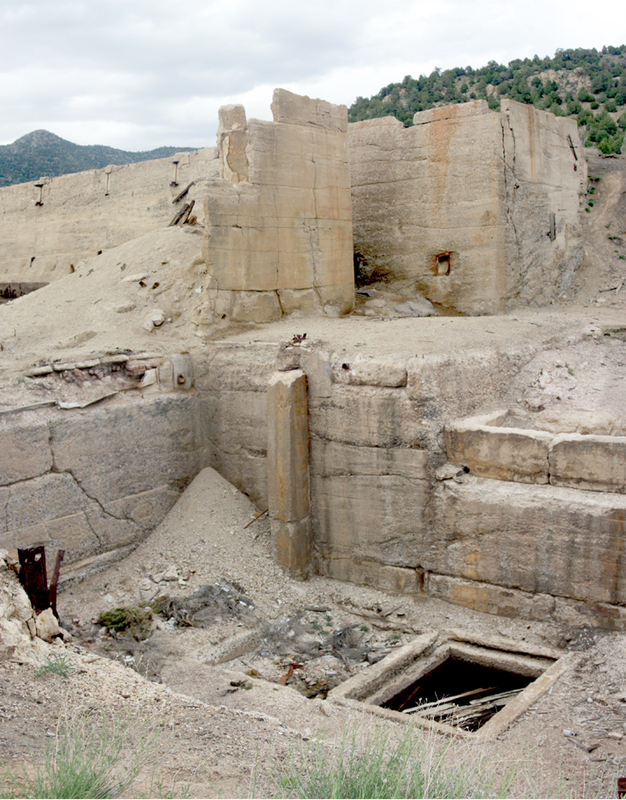 The foundations of this smelter still remain, as do residual chemicals used to concentrate the ore, including mercury. When I visited the site on Friday, I found a man and his two young girls exploring the site. I suggested that he wash off his girls’ hands and shoes carefully once they were done because the whole site is contaminated with mercury (June McNulty, who runs the Tintic Mining Museum in Eureka, told me that he used to play with pools of liquid mercury metal that would seep into pockets around the smelter). Right to the south of the old smelter lies a large heap of grayish tailings, now slowing growing a crown of weeds and grass. All the tailings left from the Knight mill were scooped up in the 1980s and placed on a pad with drainage pipes running through the pile, then a solution of cyanide was pumped and sprayed over the pile, leaching its way down through the tailings and chelating with the remaining gold and silver. The ore from these mines has been worked and reworked to get every last fraction of value out of it. But now the pile has been left just like all the other piles around, but with the addition of cyanide. I don’t know if steps have been taken to reclaim the pile, but I wouldn’t want to walk around on it. The efforts to clean up these environmental messes is necessary, but it does come at a cost beyond just money. To clean up the town and make it safe to live in, its essential history and character has been changed. The heavy equipment moving in limestone and soil has shaken apart a number of fragile historical structures, including buildings, homes, and headframes. Where there were colorful tailings piles slowly returning to nature, there are now carefully constructed fresh piles of gray limestone rocks, an ideal hideout and breeding ground for rattlesnakes (no joke here – I ran over one in my minivan as I was driving up the road to Mammoth). Eureka doesn’t look the same as it did ten years ago. One can argue that Eureka must be dynamic and capable of changing. It’s not a museum but a living town, and change is part of life. But the historian in me hates to see history destroyed in the process. That is one of the main reasons I’ve started the Elements Unearthed Project and have traveled to Eureka several times in the last few years with my cameras and equipment; as the EPA clean up progresses, the town is changing and I want to preserve what can be preserved of the history before it’s gone forever. The beryllium video second half is progressing well. I’ve decided to do the three episodes on the TIntic Mining Districts next instead of blown glass because It’s fresh on my mind and I now have all the footage and photos I’ll need. My goal is to get the beryllium video done and uploaded by the end of this week, then the Tintic videos by mid-July. Then I’ll start hitting the streets looking for financial sponsorship to continue this project. on August 27, 2012 at 3:01 am | Reply Matt R.
I must take issue with your statement that every year or two someone dies falling into a mineshaft in Utah. The last fatality in Utah from falling down a shaft was in 1996 in Stockton. Please don’t continue to spread misinformation that only leads to the quicker destruction of our sacred mining history. Matt: Thank you for the correction. You’re right – it has been over fifteen years since we’ve had a fatality from someone falling in a mine shaft. 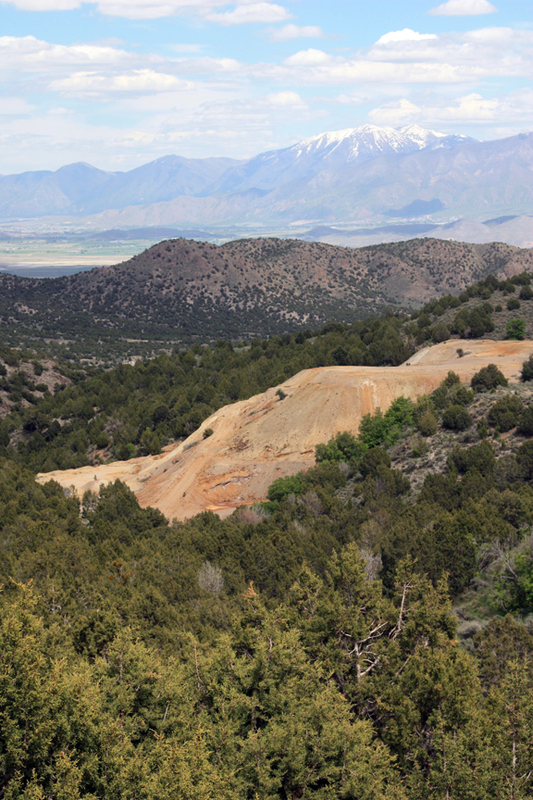 I’m on your side – I think the state of Utah goes too far in closing off all access; in the name of public safety they are systematically destroying our mining heritage, which is such an important part of our state.